For many acne sufferers, over-the-counter treatments are simply not effective enough. These people generally suffer from the more severe forms of acne, acne papulo-pustulosa or conglobata. The good news is that effective medicinal treatments are available on prescription, and the earlier the treatment is started, the lower the risk of lasting physical and emotional damage. reducing sebum production thereby controlling seborrhea. speeding up shedding of superficial skin cells (desquamation), and therefore helping to deal with hyperkeratosis. fighting bacterial infection caused by microbial colonisation. reducing inflammation and, in turn, calming down spots, papules and pustules. These are used in isolation or combined, and the dermatologist will prescribe the appropriate medication depending on the severity of the symptoms. Medical acne treatment follows a strict international standard to ensure that dermatologists and doctors are consistent in their treatment. This evidence-based guideline* gives medical practitioners information on which treatments, or combination of treatments, to use, depending on the severity of the acne and the individual symptoms. It offers alternatives to allow for different skin types and options, where appropriate, for females. Certain oral prescription medications for acne should not be used during pregnancy, especially during the first trimester, so dermatologists and doctors can suggest alternatives. Acne medication differs due to the severity of acne symptoms. Always inform your doctor about current medications to avoid interaction with acne medication. It is worth noting that acne treatment, whether medicinal or non-medicinal, takes time to take effect. The general rule is 4 to 8 weeks although it can take as long as three months, and symptoms may get worse before they get better. It is easy for patients to get disheartened and give up so it is important to persevere and keep any routines going, even if there is no immediate change for the better.
. Most cases of acne are triggered by a reaction of the sebaceous glands to androgen hormones. The sebaceous glands respond to the circulating hormones by producing excessive sebum. The combination of excessive sebum (seborrhoea) and disturbed skin cell shedding results in the sebaceous glands getting enlarged and spots appearing. These can get colonised by certain bacteria and skin can get reddened and inflamed. It is possible for people of all ages to get acne. Up to 80% of the cases of adult acne occur in women who are going through hormonal changes. This could be during pregnancy, menstruation or a hormone-related condition such as polycystic ovary syndrome. Bacteria. People with acne skin tend to have an oily, shiny complexion. This provides an ideal environment for the usually harmless acne bacteria (Propionibacterium acnes) to multiply and cause irritation and inflammation to the enlarged glands. Medication. Finally, it is thought that some medications, such as steroids and lithium, can trigger acne in people prone to the condition. As well as the proven causes, there are many myths surrounding acne, many of which point unfair blame at the sufferer. For example, there is no truth that people with acne-prone skin are unhygienic. In fact skin is more likely to be damaged by too much cleaning than it is by too little. Neither is it true to say that a poor diet leads to acne. Of course a healthy diet is preferable to a bad one but greasy foods and chocolate have little effect on acne. People with acne-prone skin don’t just have a physical condition to contend with, they can also be affected psychologically. The presence of spots and pustules on the face are difficult to hide so it is common for sufferers to lose self-confidence and self-esteem. The good news is that treatments do exist and the earlier the treatment, the lower the risk of lasting physical and emotional damage. 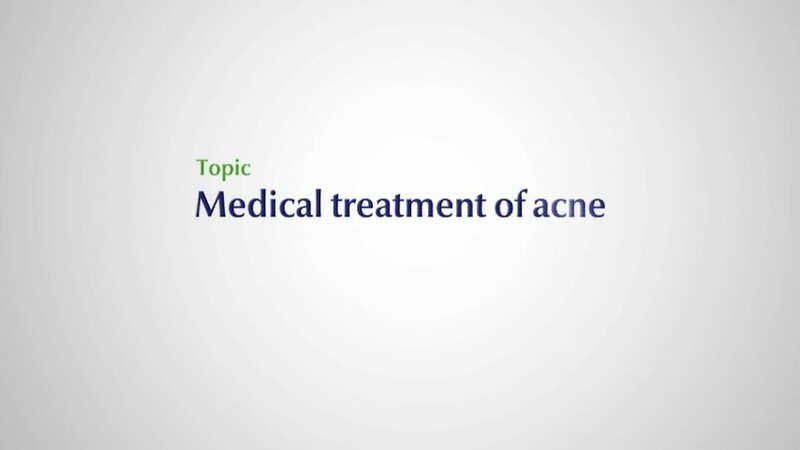 Read more about medicinal acne in general. Any make-up for acne prone skin should be non-comedogenic to avoid clocking of pores. Symptoms vary from person to person and some people react differently to foods or the environment. It is important to seek dermotological advice, even if symptoms are mild or in their early stages as effective medical treatment can prevent the condition getting worse, and minimise the risk of scarring. For hygienic reasons make-up tools such as sponges and brushes should be exchanged regulary. Although there is no ‘cure’ for acne, symptoms can be treated using medicinal and non-medicinal therapies. Medical intervention tends to be advised for more severe forms of acne or when non-medicinal alternatives have been tried but not found to be effective. The first treatment option for severe acne would be a topical gel, cream or lotion. Topical retinoids such as Tretinoin and Adapalene. Topical retinoids act on abnormal keratinisation and are also anti-inflammatory so work for both comedonal and inflammatory acne. Benzoyl Peroxide helps prevent dead skin blocking up hair follicles and also kills the bacteria that causes infection. Azelaic acid is often used as an alternative treatment for ridding skin of dead skin cells and killing bacteria and is usually prescribed if patients experience side effects with Benzoyl Peroxide or topical retinoids. Topical treatments can be combined with antibiotic tablets (mostly tetracyclines or erythromycin). If these don't work, a medication called Isotretinoin may be prescribed. Hormonal therapies can also be effective in women who have acne as oestrogen suppresses sebaceous gland activity and decreases the formation of ovarian and adrenal androgens. As with all medication, there are known side effects to certain medicinal acne therapies. These may include skin dryness and sun sensitivity, but these can often be offset by the use of adjunctive hydration care for acne-prone skin such as Eucerin DermoPURIFYER Hydrating Care. If you are pregnant or plan to get pregnant seek for derms advice about your acne treatment options. Some contraceptive pills are also known to improve acne symptoms.